not in that way), whose will corrupt your childhood memories of 80's kids classic programmes. Quite energetic for an anorexic whale, his mix of a friendly demeanour, with a mentalist edge, he takes you to places yet to be discovered. Luke started stand up in 2000, where he performed 5 gigs, which included, winning 'Red Hot Raw' @ the 'Frog & Bucket', his 2nd gig he performed @ The Lowry theatre in front of 300 people, in 'The Best in Stand Up' with Peter Kay as compere & he was profiled on 'Channel M's Interference Show.' A twist of fate (well an evil ex girlfriend) put a hold to his stand up career, only to return in September of 2005 & bring an 80's influence to the comedy circuit. 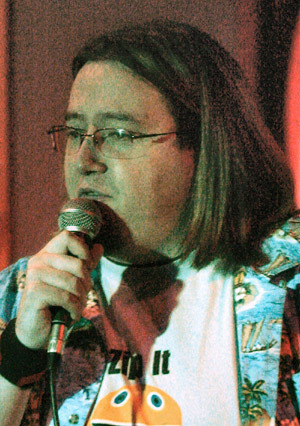 80's Luke is also a promoter, radio dj, writer, actor, comedy & most of all a stand up comic. "King Gong Winner - May 06"
"Beat The Frog Winner - 06"
"Red Hot Raw - 2000"
"Regeneration award for SLFM - 2003"
"Sliming Magazine - Slimmer of the Year Finalist - 99"
A Laughing Stock-port Road, Budweiser's Legends of Laughter, The Comedy Caboodle.